A Close Look at the NWA World Championship Belt. As low as $9.95! Growing up watching wrestling, our cable system in Kingsport, TN, carried WBTV-3 in Charlotte for a few years. This was around 1974-1976 and I saw some of the great promotional spots for the major cards they always had over the mountain down in Charlotte. During these promos there would always be information on the screen with the date of the show, the town, the building, and where you could go to purchase advance tickets. 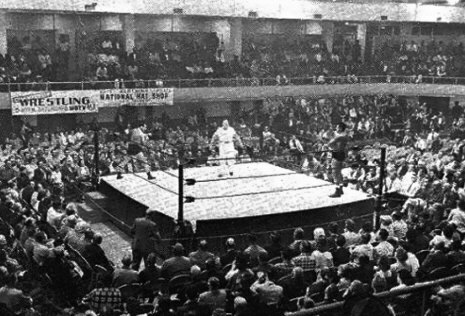 For just about as long as the Crockett family promoted wrestling in Charlotte, the primary advance ticket outlet was the National Hat Shop on South Tryon Street. Gary Silverstein is the son of the man who owned the National Hat Shop, a Charlotte landmark for just over five decades. We communicated with Gary via email awhile back and he was nice enough to share some information about the National Hat Shop and his father's relationship with Jim Crockett, Sr.
"My dad's name was Isadore Silverstein, but he was always called Izzy. He opened National Hat Shop in 1932. We had four different locations on South Tryon Street. Previous to that, he'd owned a cigar shop (Dixie Cigar Store on E Trade) and was selling tickets to events at the old Armory, the predecessor to the Park Center and the Grady Cole Center. He was in charge of the box office for all Crockett Promotion events. In fact for the Monday night wrestling events, my dad would bring the money home with him and make the deposit for the Crocketts. Jim Crockett was a close friend of my father, as was Grady Cole. My Grandfather came to Charlotte in around 1896 and opened the Vogue Men's Clothing store. My dad was born here in 1903. We continued to sell tickets to almost every event held at both the Coliseum and the Grady Cole Center (this was prior to Ticketmaster) until I closed the store in 1983." hanging on the balcony railing.